No Spill Big Bubble Bucket is exactly that - NO spilling of bubble solution. 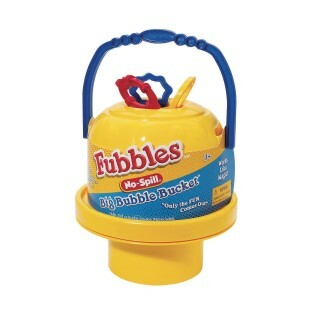 Twist open top and "easy to carry" handle for on-the-go bubble fun. Three kids can play with three oversized wands included. Holds 20 fluid ounces of bubbles (not included). Works with as little as 4 fluid ounces of bubble solution. The No Spill Big Bubble Bucket is exactly that - NO spilling of bubble solution! 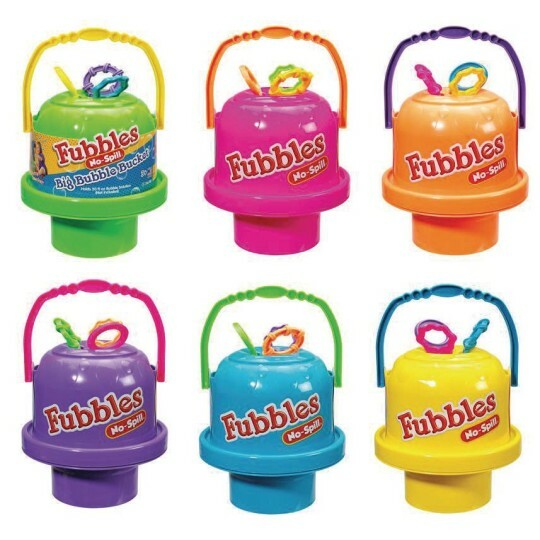 Twist open top and "easy to carry" handle for on-the-go bubble fun! Three kids can play with three oversized wands included! Holds 20 fluid ounces of bubbles (not included). Works with as little as 4 fluid ounces of bubble solution. But the best part about it - kids can play with bubbles with no spilling! Color may vary. Made in the USA. Ages 3 and up. We use these for a structured recess. Kids love them! Doesn't tip over. Only drawback was that only 3 students could use at a time. So we ordered more!